We all know that music has the power to move mountains...but, what about those special performances that accomplish so much more? 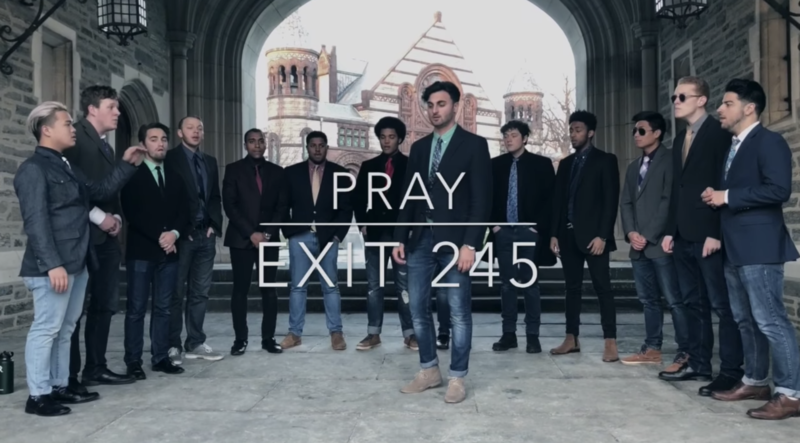 In this cover of Sam Smith's "Pray" by Exit 245, the all-male group from James Madison University has us reeling and thinking that we need to rethink all of our expectations on what good music can do for the soul. The four minute long performance is a live recording that boasts little to no production, astounding us that much further as the vocals are so pristine and together. The entire experience feels like a sort of Sunday revival, fitting given the song's title, as the backing group is so reminiscent of a gospel choir with both their dynamics and the intensity of the delivery. But, if we can just have a heart-to-heart here...Exit 245's lead is causing us to lose it! The conviction, raw power and vocal range that Giovanni Beatty is able to muster up in the span of four minutes is not only earth shattering, but simply unbelievable. This is an award worthy performance that all aca-fans and music lovers in general must watch.